American has just launched a new sweepstakes to promote their Main Cabin Extra seats, the new seating option in the economy cabin that offers more legroom and priority boarding. 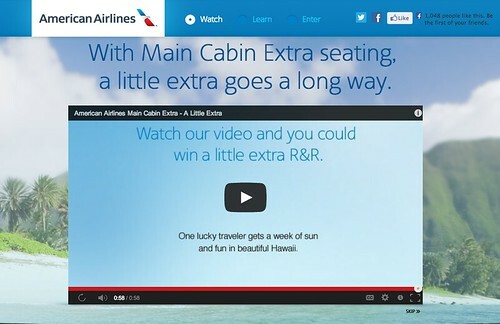 To enter the sweepstakes just watch a short video about Main Cabin Extra then submit your AAdvantage number and contact info. You can also receive an entry by purchasing or upgrading to Main Cabin Extra. There’s no place on earth quite like Hawaii. And now you could win a week’s stay for two at the fabulous Grand Wailea, A Waldorf Astoria Resort. Main Cabin Extra will get you there in comfort, and to enhance the experience, we’ll even throw in an extra, such as whale watching. You could win a week’s worth of relaxation and adventure in Hawaii. American Airlines will fly you and a friend in Main Cabin Extra to Maui. Enjoy a suite at the fabulous Grand Wailea, A Waldorf Astoria Resort and a couples massage at Spa Grande. Then you’ll have your choice of an extra, such as a sunset cruise or whale watching adventure. And to top it off? We’ll include a five-day car rental from Avis® to help you travel comfortably. During the Promotion Period, complete an official entry form in the manner(s) listed below. All entries must be received by 11:59 a.m. CT on August 30, 2013. There are two (2) ways to enter Sweepstakes. There is a limit of a total of six (6) entries per e-mail address regardless of entry method. These six (6) entries can be achieved via method A below or a combination of methods A and B below. Entry limitations associated with an entry method, if any, are specified below. Only fully completed entry forms are eligible. A. To Enter Online: Visit the “A Little Extra” sweepstakes page and (i) watch the brief posted video; and (ii) complete all required fields on the online entry form and submit as requested to receive one (1) entry into Sweepstakes. Entrant may enter Sweepstakes up to six (6) times via this method of entry. B. To Enter via Ticket Purchase or Seat Upgrade: Entrant can receive one (1) Sweepstakes entry after registering for the Sweepstakes as specified above and then by either: (i) purchasing a Main Cabin Extra seat; OR (ii) upgrading a current seat to a Main Cabinet Extra seat. Limit to one (1) entry via this entry method. Ticket purchases using AAdvantage miles or AAirpass do not qualify to earn the entry. In order to be eligible for an extra entry via purchase or upgrade the user must purchase with the same email address used in the Sweepstakes registration process. Ticket purchases, upgrades, and travel must be completed by August 30, 2013. (iv) a $350 AmericanAirlines VacationsSM Gift Certificate, ARV: $350. Go here to enter. Good luck!! Win 2,500 AAdvantage Miles: Don’t forget that the Frugal Travel Guy’s Monday Deal of the Day is sponsored by AAdvantage. Share you best AAdvantage, American Airlines, or oneworld related deal or tip for a chance to win 2,500 AAdvantage Miles! Go here to find out more. Win a trip to Norway: Speaking of winning stuff…Cindy at Points & Travel has a super cool reader giveaway that offers the winner two round-tip tickets to Norway! The odds of winning her sweepstakes are probably much better when you compare them to the odds of winning a big sweepstakes sponsored by one of the airlines. Go here to learn more. Thanks for the mention about my sweepstakes, it will end June 30, 2013. So AA values it’s miles at $0.019/mile Interesting. I suppose it saves on the taxes the winner will be liable for. For the Little Extra sweepstakes, is there any confirmation for every entry? I did couple of entries after watching the video but nothing in my inbox.